Tiles are commonly laid in wet areas such as bathrooms, laundry, kitchens or restaurants and eateries. These areas are often high traffic areas in a damp and/or humid environment, creating a perfect breeding ground home to ever growing and evolving microorganisms. These can evolve in to mould-based bacterias that can contribute to respiratory problems, digestive issues if transferred in to the body, plus contribute to many more common yet avoidable diseases. So here are the top 3 reasons why you should book a professional tile and grout clean. The tiles in your home and the grout surrounding each tile, inhabits a world of nasty microorganisms brought in by dirt, grease and stains. Regular bathroom cleaning regimes may minimise surface dirt and germs, yet the dirt and germs are difficult to remove from the grout itself. Many people are unaware of the germs and even lime scale and scum that get trapped in the grout pores, and the rate in which they spread when not cleaned with the right tools. This increases health hazards, affecting those with respiratory problems, allergies and leaves the body open to many other problems. The dirt and germs trapped in the grout alone will omit odours and create an unhealthy air quality especially in wet and humid areas. A professional clean will not only clean and restore the floor tile appearance, yet extract the germs and dirt for a more hygienic environment. A deep professional clean will always enhance the appearance of flooring and especially with a tiled surface. The dirt that gets trapped in the grout discolours the appearance and the reflection of the light is reduced, causing a dull look. A professional tile and grout clean will no doubt increase the longevity of your tiled surface, especially if you have high porous tiles. If the porous is not sealed, water or other dirty liquids or stains can soak deep in to the grout, making it harder to extract with a general clean. Removing dirt, soap, scum and the bacteria that can eat away at the porous, will enhance the appearance of your tiles and make them last through the years. Cleaning your tiles regularly with harsh or acidic household cleaners, can do more damage to your tiles and the grout than you think. The acids within the cleaning products can literally eat away at the grout. A harsh scrub on a stain you want removed along with these harsh products used, will eventually lift and wear away the grout, even causing lifting and cracking. A professional tile and grout clean will ensure a deep and sanitised finish, and save you time on attempting a deep clean and indeed save you money without those over marketed cleaning solutions. Many seek a sealant for their tiled flooring, however in our experience, this becomes quite costly and is prone to flaking and can cause your tiles to appear patchy. Usually this results in the removal of the sealant, the tiles cleaned and then resealed again, and at an average cost of $20 per m2. To avoid this hassle and cost over time, it is best to book a regular (residential) professional tile clean and stick to a weekly mop with some white vinegar, to maintain your tile and grout between cleans. So there you have it. We recommend a professional tile and grout clean at least twice a year at minimum for households. If you manage a high traffic business such as a day care facility or restaurant or professional kitchen, we recommend a more regular professional tile clean. 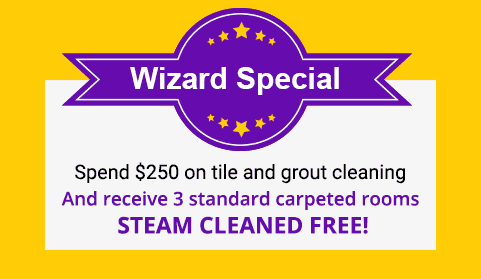 If you are unsure as to the professional cleaning regime your household or business requires, call the experts at Wizard Tile & Grout. Our decades of experience will save you time and money and instill peace of mind.